We offer this group trip to improve the quality of education, create employment opportunities and promote positive integration between tourists and local communities in Guatemala. A chilled out beach town on the Pacific Coast offers you the chance to surf fast waves and volunteer in the local community. ​Take part in ​sustainable education, enterprise and environmental projects to improve human and environmental well-being in the community. 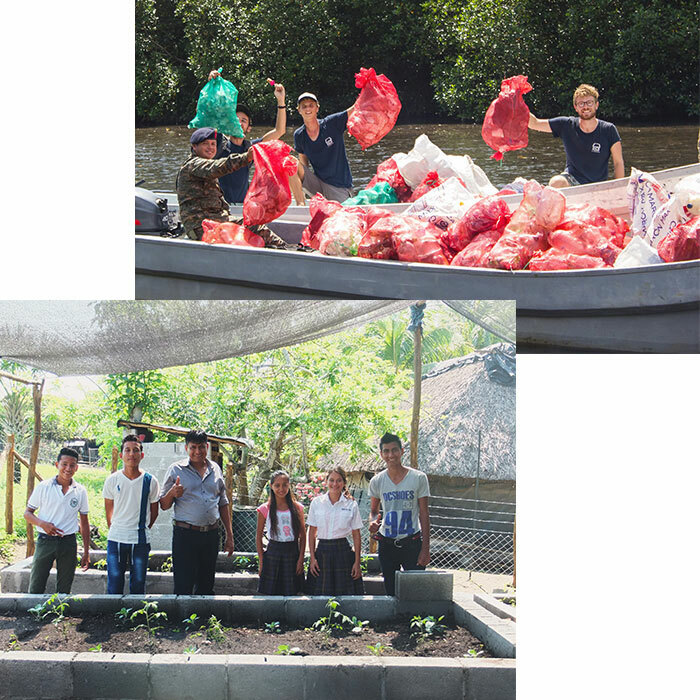 Get involved with classes & workshops focused around our organic garden at the secondary school, art activities using recycled materials as well as beach clean ups and mangrove reforestation projects. Volunteer with the Buena Vista Library team hosting story hours, literacy games, art activities, sports and movie afternoons. Have a specific project in mind for your group? We will work with the local community’s needs to put together a program that will contribute to long lasting development. El Paredón lies on the Pacific coast of Guatemala, 3 hours south of Guatemala city. It is located at the end of a 40 minute dirt track and is a small village of around 1,500 people. The village is largely off the beaten track, yet is growing in tourism due to its beautiful black sand beaches, good surf and welcoming community. It is surrounded by mangroves and rivers, bringing a wide array of wildlife to the area. Alex, can you guys help out with this info? El Paredón Surf Camp was the first hostel to open in the community. With a beautiful beachfront location, it is made up of rustic cabanas set in a tropical garden and is a laid back, peaceful place complete with yoga deck. It generally appeals to those wanting a more relaxed time in El Paredón, closer to the community. You will volunteer with our partner organization, La Choza Chula. 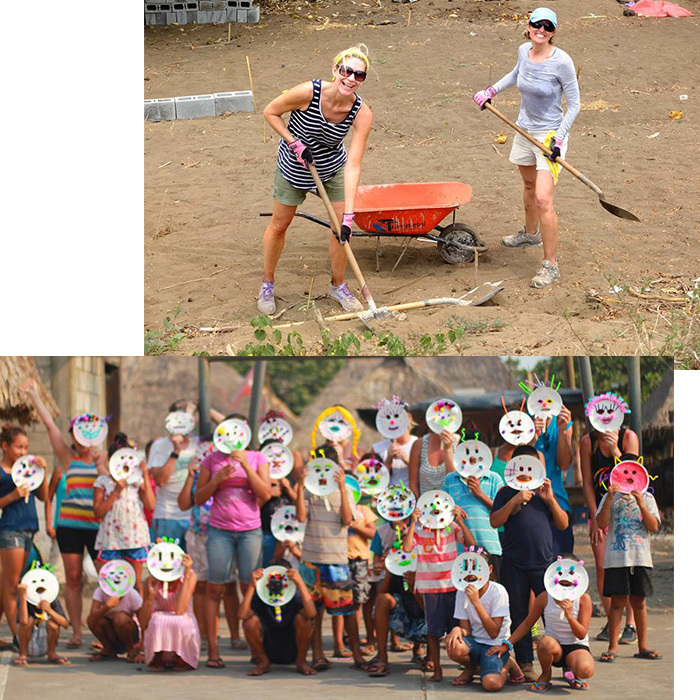 Group volunteer activities with Choza Chula are split into three main focus areas: Education, Environment and Enterprise to align with their mission to improve the quality of education, create employment opportunities and promote positive integration between tourists and local communities. In your free time enjoy the true paradise on the Guatemala coast. Go surfing or paddleboarding, crabbing or fishing in the mangroves, horseback riding, or bracelet making with the local kids. El Paredón is a secret surfing paradise as it has decent waves year-round. Some say it is the best sur ng spot in Guatemala. With a fast breaking beach break, the sea is strong, with strong currents, so you need to be a good swimmer to go in deep. The sea is warm all year round so there is no need for wetsuits here – just bikinis and boardshorts! A hot and sunny day, feeling like 31°C even after we account for wind, and very warm water temperature (30 °C). La Choza Chula – a wonderful combination of cultural immersion and sustainable development in action. Great people and even better friends, with awesome plans to help the community! What an incredible program in a great community! Their facilitated programs are well executed and directly benefit the local community. The staff as well were very helpful, knowledgeable, passionate and kind! A remarkable small organization making a huge impact on this tiny village!